Science fiction blog io9 called it, “Life imitates V,” and in a way they’re totally right. On the ABC sci-fi show V (which I’ve watched and that I believe to be an excellent show), there’s an ongoing subplot concerning a priest, Father Jack Landry, and how the Vatican and the Roman Catholic Church responds to the presence of alien life. Amusingly enough, art is indeed imitating life as the Vatican Observatory and the Pontifical Academy of Sciences hosted a five-day meeting of international scientists to discuss the prospect of alien life and to pontificate on how those aliens fit into the Vatican’s idea of God’s plan of the universe. That’s the belief I have about science versus religion. They’re not in opposition to one another in my worldview. 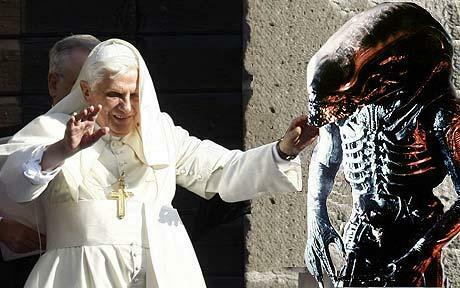 To me, the two can work hand-in-hand (see the Vatican’s green energy initiative). Science seeks to explain the world that God (or whatever higher power you endorse) has created; it’s as simple as that. That’s my take, anyway.